This private setting offers a newly remodeled home with a great floor plan. The main level (upper floor) offers the Master bedroom with queen bed, bedroom two with Twin over Full bunk bed, full bathroom, large kitchen, dining room and living room (sorry the fireplace is currently non-operational). A deck off the kitchen completes this floor nicely. The ground floor level offers another living room, bedroom three with a queen, bedroom four with a twin over full bunk bed, full bathroom with tile walk in shower and washer and dryer. Note from Owner: "Welcome to our Lovers Lane home. This is a special place for us, and we are so happy to share it with you. We bought this home for our large family to enjoy, and we are sure you will find plenty of space for your family. You will find restaurants, entertainment venues and stores with anything you need just a short drive away. However, when you are actually on the property, it feels like you are in your own universe. With only a few other homes nearby, thick woods and rolling dunes, the quiet and solitude are amazing. Of course, the best part is that 300 feet of private Lake Michigan beach, shared by only 4 other properties, is accessible right at the end of the driveway--up a sand dune and down the other side. Whether you want to relax on our beach chairs, splash in the waves or paddle out into the lake on our kayaks, there is nothing like being on the shore of Lake Michigan on a summer day. One of our favorite things to do is to take a bottle of wine down to the beach and watch the sun set over the lake. We also love to bike, and you will find miles of bike paths and quiet country roads to pedal on. When it's time to eat, if you are not in the mood to barbecue on the deck, the Sandy Point Beach House, only a mile from our house, serves excellent food. Other favorites include the New Holland Brewing Co., The Itty Bitty Bar, The Black Sheep Baa and Grill and Butch's in Holland, about a 15 minute drive from Lovers Lane. Enjoy your stay by the lake at Lovers Lane!" Grand Haven is located on the shores of Lake Michigan. We are a quaint, little beach town recently named the "Happiest Seaside Town in America," by Coastal Living Magazine. Here, your family will find Grand Haven State Park, which was voted in the Top 10 Best Beaches in the world by Travel+Leisure Magazine. The boardwalk stretches one and a half miles, beginning at Chinook Pier and ending at the iconic red lighthouse. Historic, affordable, and amusing, the trolley is continually traveling throughout the waterfront and downtown areas dropping you off at any desired location. At the end of the day, grab a blanket to sit on and head to the Waterfront Stadium where the whole family can enjoy the Musical Fountain. This synchronized lights, water, and music show has coined the title "World's Largest." This free show plays nightly at dusk throughout the summer. Lucky for you, all of this is just minutes away and waiting for you to revel in. Holland is located on the shores of Lake Michigan and Lake Macatawa. Here, you can spend your days at Holland State Park where there is plenty of room for family fun along the white, sandy beaches. You and your family can take an excursion to Nelis' Dutch Village, DeKlomp Wooden Shoe Factory, and Veldheer Tulip Gardens. These places will bring you back in time to experience the Netherlands of the 1800's. If you find yourself in Holland the first week of May, be sure to take a look at the over 6 million tulips blooming throughout the city during Tulip Time festival, which was named the "Best Small Town Festival in America" by Reader's Digest Magazine and received USA Today's "2016 Best Flower Festival!" Downtown Holland is known as the "Great American Mainstreet." Make sure to spend a day downtown where an abundance of shopping and dining can be found, as well the funky street performers who will surely entertain you with their acrobatics, magic, music and more! When evening approaches, you can return to the beach to watch the sunset while roasting marshmallows over one of the many fire pits found along the sandy shore. From the award-winning downtown to the exceptional beaches and Dutch heritage, your family will fall in love with Holland's small town charm and big city amenities. When we arrived there were a couple of women still cleaning and they were very kind. Overall we had a wonderful time. Our AC was not working properly one night of our stay. This was taken care of very quickly. We would recommend Lover's Lane to anyone! This home was perfect for our family of 6. The short walk to the beach and the private beach area was golden. 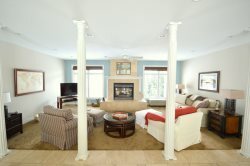 The house is very well kept up and enjoyable to relax in during any down time. We would love to stay here again! All staff was courteous and prompt. I received prompt answers to all of my questions throughout the registration process and as our trip got closer. Everything on the property worked the way it was advertised - what a joy! We loved this spacious home. More than enough room for our two families. The short walk to the beach was key for our children! 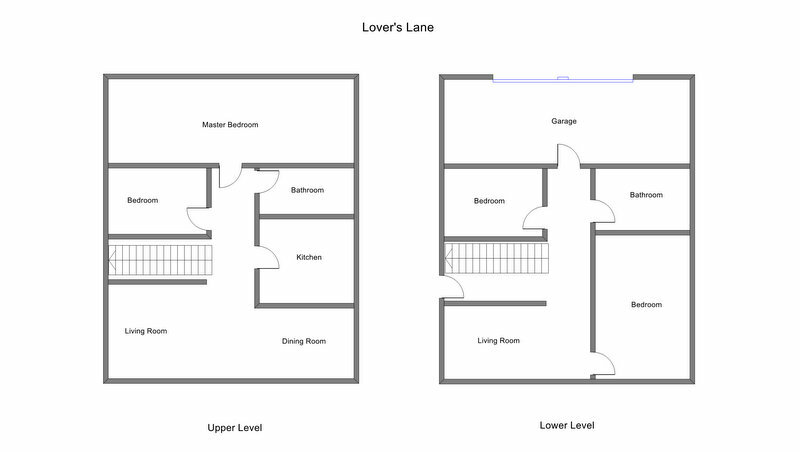 Two levels of living space (each with two bedrooms, a full bath and a family room) ensured we all had plenty of space to relax - together or apart! Perfect spot to enjoy some peace and quiet as well as explore the surrounding lake communities. Everyone I communicated with during the reservation process (either phone or email) was very helpful and friendly. Sometimes, it was a little difficult to get through on the phone, though. Our family had a great vacation at Lovers Lane, and the property exceeded our expectations. We were pleasantly surprised that there were 2 kayaks, beach umbrellas, beach chairs and toys, etc., for us to use...........and they were conveniently located near the beach. We also enjoyed the deck, sandbox and basketball hoop in the driveway. Absolutely loved it! We enjoyed all the amenities afforded us during our stay. The property was well off the beach as to not be pestered by traffic, but close enough that the small walk was nothing to get to the lake and the beach! The staff was very polite and answered all our questions. As I stated above, the house was big and spacious and very clean. It was supplied with everything you needed in a home. Everyone in our group loved it. The private beach was so awesome and the short walk to the beach was very inviting. I would have loved to stay longer. We will definitely be back. Check in time is 3pm or after. Check out time is 10am or before. Half of the total cost of your stay is due upon booking with the remaining balance due 30 days prior to your stay. Pets are not allowed unless stated otherwise in the property listing. If pets are allowed a separate pet agreement will have to be signed and pet fee and deposit paid.